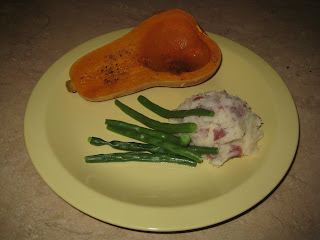 Here's an easy recipe for a simple dinner using Butternut Squash, Green Beans & Mashed Garlic Red Potatoes. FYI--I don't use a lot of measurements in cooking (unless baking), especially if I am not following a recipe. 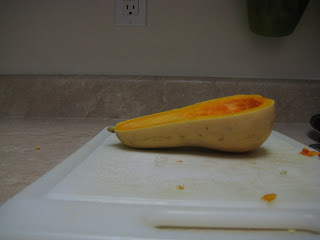 Butternut Squash, or to the scientific geeks, Cucurbita moschata. It has a tough exterior yet a soft fleshy interior, like many people I know;) Butternut squash has a more delicate, lighter flavor than pumpkin. 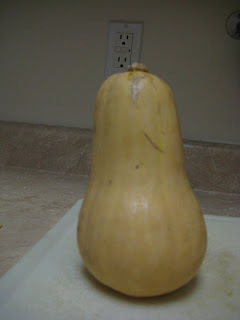 It can be pureed into soup, chopped, diced, cut into chunks for casseroles, or simply halved & baked. This recipe goes with the latter. 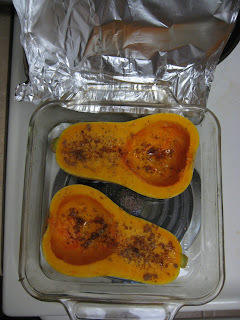 With a sharp knife, cut the squash in half lengthwise, like so: Next, place the halves in a baking dish, face-up & add water to the bottom of said dish. Lightly drizzle with olive oil, brown sugar & a dash of salt and freshly ground black pepper. Cover with foil and bake at 425F until the flesh is super soft and can be easily pierced with a fork. If you've ever made a baked potato, it should have that same soft consistency in the center--that's how you know it's done. 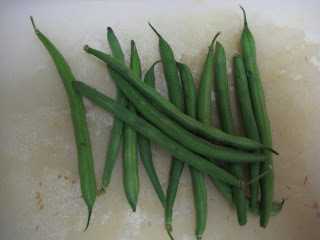 Simply cut off the ends, put them in a steamer and steam until tender crisp. If you try this meal, or any of the components of it and enjoy it, let me know!